The Centre for Politics and Media Research and Centre for the Study of Journalism, Culture and Community are very pleased to announce the publication of “US Election Analysis 2016: Media, Voters and the Campaign”, edited by Darren Lilleker, Einar Thorsen, Daniel Jackson and Anastasia Veneti. research insights on the 2016 US Presidential election on from the cutting edge of media and politics research. Published 10 days after the election, these contributions are short and accessible. Authors provide authoritative analysis of the campaign, including research findings or new theoretical insights; to bring readers original ways of understanding the election and its consequences. Contributions also bring a rich range of disciplinary influences, from political science to history, journalism studies to advertising. Thanks to all of our contributors and production staff who helped make the quick turnaround possible. We hope it makes for a vibrant and engaging read! We are pleased to announce the call for papers for the forthcoming International Conference of Political Communication organised jointly by the Research Committees for Political Communication (RC22) and Electronic Democracy (RC10) of the International Political Science Association (IPSA) with the CICOM 33rd, International Communication Conference, a yearly event organized by the School of Communication of the University of Navarra (Spain), under the title of “Political Communication in Uncertain Times: Digital Technologies, Citizen Participation and Open Governance”. The conference will be hosted by the University of Navarra in the city of Pamplona, Spain. The unexpected British exit from the European Union, the migration crisis, the rise of Isis, conflicts in countries as Syria, the emergence of populism and unpredicted citizens’ reactions (such us the rejection of Colombia Peace Plan or the election of President Trump) are only some of the events that are taking place nowadays; they all have in common the uncertainty that brings with them and that characterize the current era. The purpose of this conference is to consider the state of media and communications research in a political period marked by a variety of events that take place within an uncertain context. The conference theme focuses on the intersection between the role of political communication and digital technologies, both understood as potential pillars that may enhance democracy in a communication context characterised by continuous crises and their transnational consequences. Papers should make a contribution to the development of theoretical or empirical studies regarding digital political communication conducted by diverse actors that range from governments, political parties, media organisations, to non-governmental actors, citizens and social movements. Scholars, researchers and professionals are encouraged to submit paper proposals that either broadly or specifically deal with the aforementioned issues, be it by addressing national or comparative studies, theoretical or empirical ones. New challenges for journalism and communication in a digital society: What changes have journalists and the media in general gone through? Do digital technologies change traditional concepts of media power? Do media and communication technologies support the formation of community? Media coverage and journalist behaviour during moments of political turmoil: What role can media play at times of crisis? Which frames appeared repeatedly while media reported about an event? Is there any danger regarding the empowerment of certain voices while others are ignored? Digital technology in election campaigns: How have election campaigns changed in styles, strategies, tools and with what impacts on voter engagement? What factors are shaping election outcomes in the digital age, and to what extent? Relationship between representatives and citizens: How do governments and institutions deal with the opportunity and challenges introduced by digital technologies? Do they help to promote a real conversation between both sides? To what extent do they reduce the gap between them? New parties in the political scene: Are new technologies promoting the emergence of populist parties? To what extent communication from a new party is different to those from traditional parties? Is there any visible pattern shared by new political actors? Political actors and new technologies: To what extent are new technologies shaping political parties? Can we distinguish different practices and uses depending on the countries? Are those different practices somehow driven by any ideological perspective? Digital Technology in public diplomacy: How digital media are shaping international political communication? How should international political actors adapt communication to the new digital audiences? Do digital media allow dialogue and interaction with international publics? New voices, a multiplicity of agents in the public sphere: Can digital technologies transform the characteristics of the traditional public sphere? Is it possible to have an online public sphere? Will an online public sphere enhance democracy? Do media technologies constitute a new public sphere? Mobilization and participation: Are digital technologies really able to empower citizens' political participation? Do they empower specific voices in detriment of others? To what extent social media play a relevant role on social movements? Can we talk about social media echo chambers in some results of recent political events? Abstracts should be in English and the deadline for their submission is 30th January. Research Question: In what ways and under what conditions does political communication via digital platforms lead to increased and enhanced levels of engagement on the part of citizens? Rationale: A wealth of studies have explored online political communication since the early 1990s, parallel to this research significant interest has been given to how digital technologies offer pathways to participation. We have learned from a range of studies that there are indications that digital technologies, and particular the spaces that permit social interaction, may facilitate forms of political engagement and lead to greater citizen mobilisation and participation in some forms of civic life from the very local to the supranational. While political participation on social media have been dismissed by some as lacking meaning, others propose that political participation should not be understood as a one-dimensional but as a multidimensional activity encompassing a range of activities. These activities include those that take place in the domain referred to as the ‘electronic republic’ or ‘digital agora’ where opinions can be expressed, understandings gained, alliances built and influence exerted vertically and, potentially, horizontally so realising the democratic ideals of collective participatory and semi-deliberative decision-making. There is much evidence that the conditions for and circumstances of political participation are adapting, however research shows a politics of disconnection with and re-alignment from electoral politics. Online tools can enhance learning, build communities or groups of online advocates, and facilitate a range of forms of engagement and participation but seldom, the notable exception being Barack Obama in 2008, are those tools utilised to their full potential by parties or individuals who seek votes or gain election to the chambers or loci of power. Rather we find that controlled or faux interactivity is the norm with little opportunity for influence and visitors required to work for the political actor or organisation rather than work with them. This special issue will explore the nexus between the use of the digital environment by political actors and organisations and the extent that their colonisation of the social web enhances engagement and participation. Articles will be theoretically driven analyses of empirical data and should focus on key questions arising from studies to date. For example: To what extent and under what conditions do political actors mobilize citizens and does this facilitate the emergence of new participation patterns? Does the social communication facilitated by digital technology create the conditions for new patterns of engagement with political actors and organisations or does their use for political communication just replicate longstanding paradigms? To what extent to we find political communication, political platforms or policy to be co-created and how can the forms of participation which lead to co-creation be understood, defined and measured? Our aim is to explore whether use of the Internet, particularly the features associated with the second digital wave of social media, which allow access to both pluralist and polarized information, but also facilitates interaction with texts, artefacts, is likely to enhance engagement with electoral politics or increase patterns of disconnection in this realm of politics while increasing greater engagement with non-electoral, issue politics. We will extend academic understanding of existing theoretical and empirical debates on the future of representative democracy in order to develop new understandings, applications and developments of theory to aid us to explain how the all-pervasive use of digital technology impacts upon democratic processes. Theoretical approaches that would seem appropriate are those surrounding theories of democracy and representation; public sphere approaches as well as theories concerning the cognitive and behavioural dimensions of political participation. All submissions should be submitted via the journal’s website. All submissions will be reviewed. The deadline for abstract submission for “Communication, Democracy and Digital Technology” conference organised by IPSA’s RC 34, RC 22 and RC 10 in Rovinj, Croatia on 2 and 3 October 2015 has been extended to 31 January 2015. The conference is organised by a committee formed from IPSA RC10 (Electronic Democracy), RC22 (Political Communication) and RC34 (Quality of Democracy). The conference is going to take place in cooperation with the Faculty of Political Science, University of Zagreb. The conference theme focuses on the intersection between the work of three strands of political science, all of which ask questions of vital importance for the well-being of democracy globally. These questions revolve around measures, standards and analyses of the quality of democracy, the role of political communication in enhancing democracy and the extent that information and communication technology offers potential for a richer, interactive and co-created politics. Without imposing any normative ontologies onto the discussion we enquire how communicative acts, particularly but not exclusively those which take place using digital technologies, contribute positively or negatively to the quality of the democratic experience for citizens and to sustaining active democracies. We therefore invite papers which contribute theoretically and empirically to this and relevant debates. Papers should have the concept of democracy (political participation, engagement and deliberation) at their heart and make explicit links to the contribution from theory and practice of digital political communication either by governments, political parties or candidates, media organisations, citizens, non-governmental actors or social movements. Papers focusing on cross-national comparative analyses are particularly welcome. Abstracts should not be longer than 500 words. Abstracts should be emailed to ipsa2015@fpzg.hr and must be received by 20 January 2015. Notifications of acceptance will be sent by 1 March 2015. Conference fees include participation, conference packs, coffee breaks and welcome event. Please note that all participants wishing to attend need to pay a conference fee. Preferential rates have been negotiated in hotels Lone and Eden for the participants of the Conference. Hotels are located next to each other and are within a 10 minutes walk from the beautiful city centre. For more information about hotels check http://www.lonehotel.com/en/ and http://www.maistra.com/Eden_Rovinj. Rovinj is only 30 minutes away from Pula airport which is very well connected with several European airports. Rovinj can also be easily reached via Trieste, Zagreb and Ljubljana. Special conference shuttles will be organised at all times from all these airports to Rovinj and from Rovinj to these airports. We would like to invite you for submitting a paper proposal for our workshop “Political Engagement in the Web.2.0 era. Co-Production in Election Campaigning” supported by Standing group on Inte... organized within the ECPR Joint Session conference in Warsaw. The conference will take place at the Warsaw University from 29 March to 2 April 2015. The deadline for submitting paper proposals is 1st December 2014 at http://ecpr.eu/Events/EventDetails.aspx?EventID=90 Please find below the short Call for papers and attached the longer version. Should you have any questions please contact us at ecpr2015@gmail.com no submission Our aim is to select the best papers, with a further purpose of publication (for those interested) in a special issue of a good journal or edited book. ABSTRACT Political engagement is at the center of political science research, especially concentrating on traditional and non-traditional web based forms of political participation. Debates are emerging surrounding new forms of participation offered by new digital wave era technologies, especially through the participatory opportunities offered by new communication platforms (such as social networks and microblogs). The aim of the workshop is to cover both aspects of political communication: the supply side - offered by political actors and the demand side – how audiences-citizens are interacting, or indeed want to interact with political actors. The workshop will focus on key questions arising from current studies. How do political actors communicate with their supporters and adversaries within the new communication environment created by platforms allowing for wide dissemination of information? Is there an emergence of new participation patterns among citizens or do digital technologies simply reinforce existing practices? Are traditional forms of political engagement challenged by new online participatory behaviors? Have any new forms of political engagement and participation emerged or are they just replicating longstanding paradigms? If new forms of engagement or participation are emerging, how can they be defined and measured, is the division between traditional and non-traditional, offline and online artificially sustained, or do they now overlap? Alternatively, are the new online engagement possibilities attracting different groups of citizens previously excluded? 2013 RC22 Conference in Granada, Spain. We are pleased to announce the upcoming joint conference of the Research Committee for Political Communication (RC22) of the International Political Science Association (IPSA) being organised in conjunction with Masaryk University*. Prospective speakers are encouraged to submit paper proposals dealing with national or comparative cases addressing any aspect of political communication, journalism, new media, policy developments or other related issues. 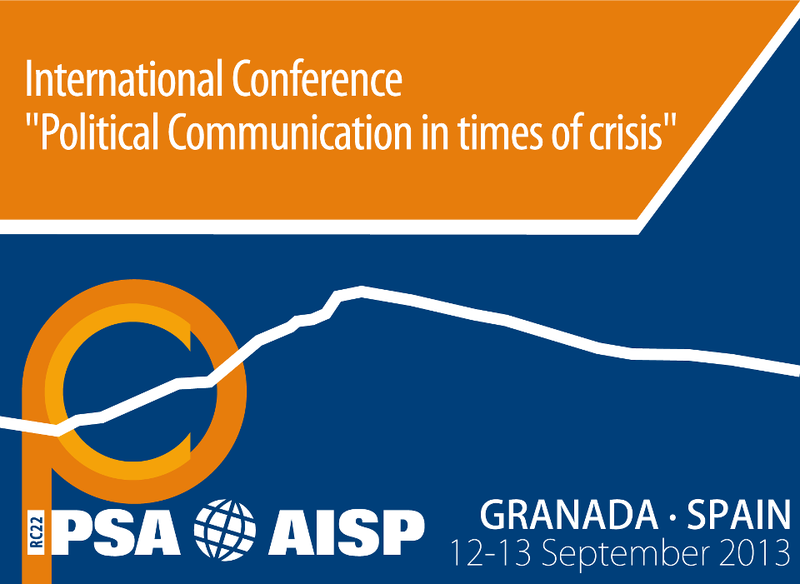 We are pleased to announce the upcoming joint conference of the Research Committee for Political Communication (RC22) of the International Political Science Association (IPSA) being organised in conjunction with the Political Communication Section of the International Association of Media and Communication Research (IAMCR). The conference will take place in Lisbon, Portugal, on November 17-18, 2011. The IPSA Research Committee for Political Communication (IPSA RC22) invites you to submit a paper proposal for our panels at the IPSA World Congress "Reshaping Power, Shifting Boundaries", taking place in Madrid, 8-12 July 2012. For more information on the congress, please consult the IPSA Website at http://www.ipsa.org/events/congress/madrid2012/congress-theme or contact the IPSA World Congress team (details at: http://www.ipsa.org/events/congress/madrid2012/contact-us). If you are interested to participate in the Political Communication panels please contact Dr. Dominic Wring (Chair of IPSA RC22) at D.J.Wring@lboro.ac.uk. The deadline for submissions of proposals is 5th August, 2011. Please send the name of the paper alone. There will be a later date (September) for the submission of the synopsis.